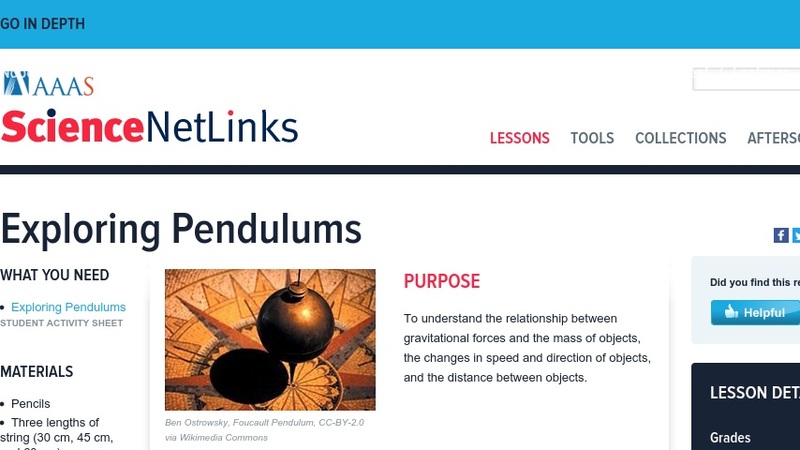 In this lesson for middle school, learners observe the movement of pendulums in order to understand how gravitational forces act and how they affect changes in speed and acceleration of objects. It starts with a brief exploration of Galileo's experiments with pendulum motion, then introduces websites with pendulum simulations, and culminates with a lab in which students construct a pendulum, test its period/frequency, and vary length of the string. This resource comes with warm-up questions, printable student guides, and complete lesson plan. Science NetLinks is a part of Thinkfinity, a partnership that provides free Internet-based content across academic disciplines. Science resources are aligned to AAAS Benchmarks for Science Literacy.